It only takes a few minutes inside the historical old town, or a quick stroll along the 1.7km long pedestrian street to realize that Plovdiv is a special place all its own. Roman ruins, a fun bar scene, great shopping and super aylak (relaxed) people make this enchanting town a must see for any traveller visiting Bulgaria. We spent 5 days in Plovdiv and wish we had 5 weeks! Plovdiv is the 6th oldest living city in the world and it is the second-largest city in Bulgaria after Sofia. The town was originally a Neolithic Settlement of the Thracians back in 4,000 B.C and it has been occupied ever since, making it the oldest continuously inhabited town in all of Europe. This incredibly rich history has given Plovdiv one of the most charming old towns in Eastern Europe. 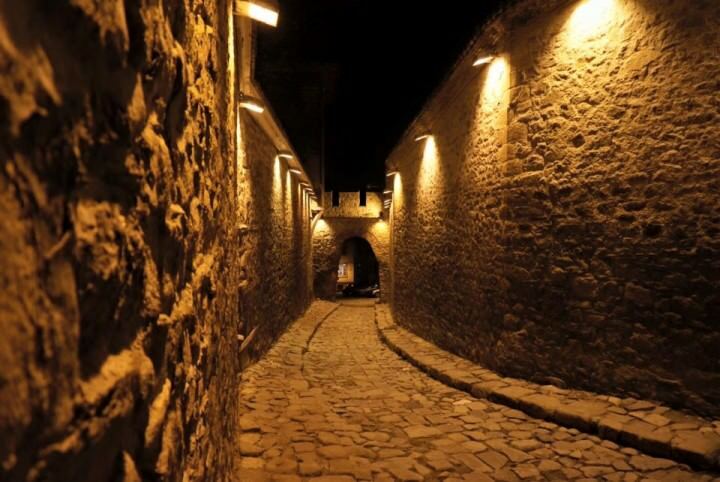 Enormous stones cobble the streets, making for stunning photos, bumpy car rides and sore ankles. Parts of the ancient wall can still be found in certain areas of the town and there is a spectacular Roman amphitheatre that commands a cliff overlooking the Kapana neighbourhood and the more modern part of the city. 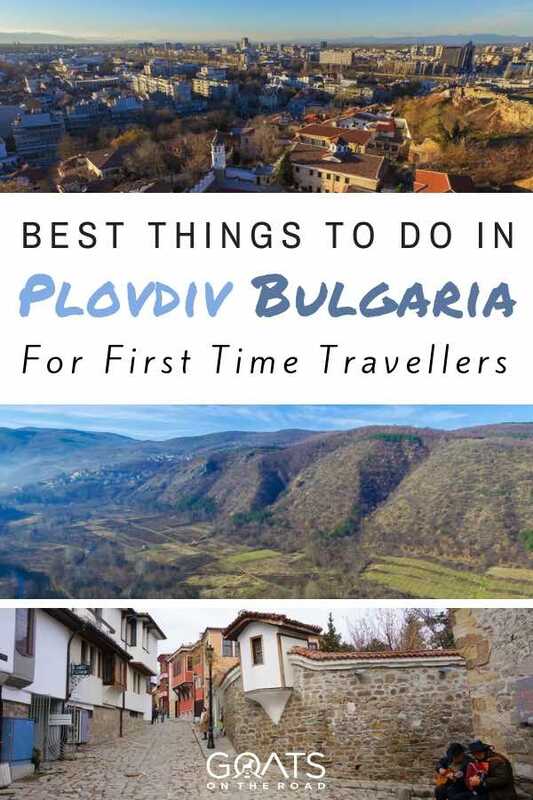 Some places of interest aside from the ones I listed above include the Ethnographic Museum, the Eastern Gate to the city, and the Asymmetrical House (you’ll see all of these if you join number 2 on this list). An excellent way to take in most of Plovdiv’s best sites and learn about the unique history of the town is to join the FREE walking tour. You can meet the guide at 2:00pm in front of the Municipality Building on the Pedestrian Street. 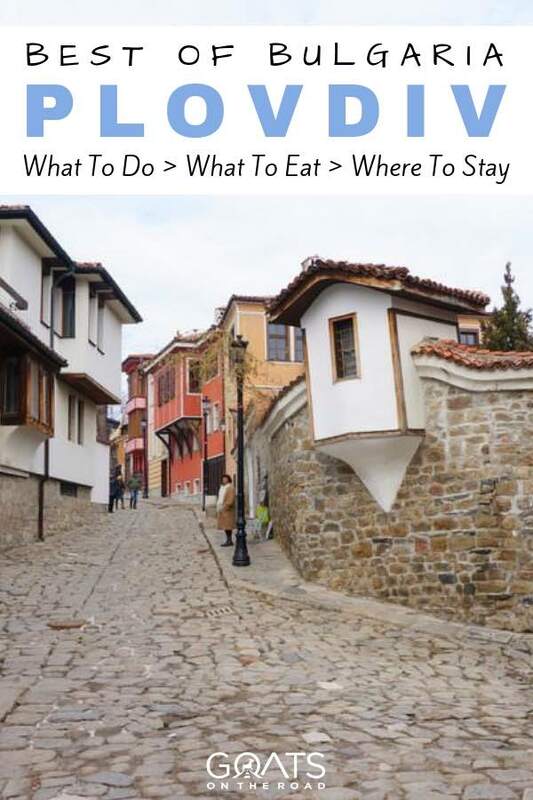 You really can’t ask for a better introduction to Plovdiv and the guides tend to be great characters themselves (we went out for beer with ours after the tour). We recommend joining the tour on your first day in Plovdiv, so that you can get orientated in the city and in its place in history. The walking tour will take you to many of the most important historical sites, so I won’t list those ones in this article. For more information about the walking tour, check out their website. The main pedestrian street (Knyaz Aleksander I or Aleksander Batenberg Street) runs for 1.7 km from north to south right through the center of town (not technically the “old town” but close to it). You can stroll back and forth along this street for hours. There are many shops selling everything from boots to bottles of wine and there are also a few great cafes with tables spilling out onto the street. Most of the buildings along Knyaz Aleksander were built in the late 19th and early 20th century and while many of the best examples of architecture have been converted into shopping malls, they’re still beautiful from the outside. 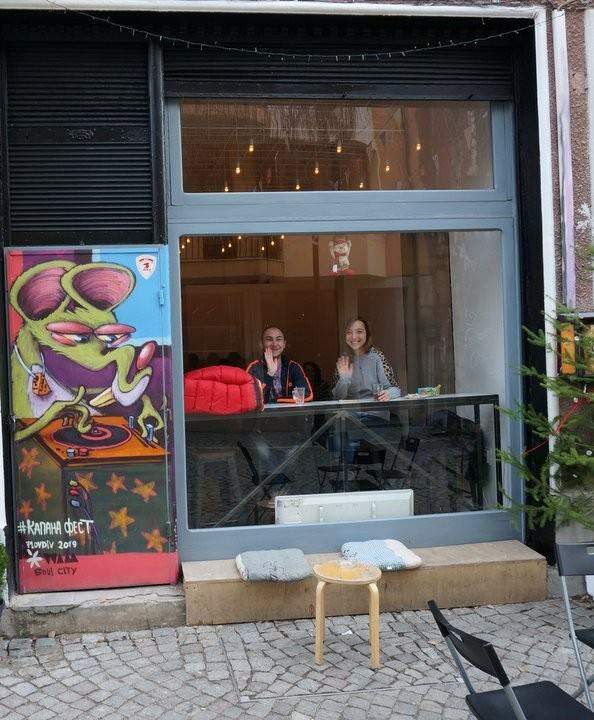 Check out Sladoledena Kashta Afreddo on the pedestrian street for some great cafe style snacks & desserts. You can’t miss it because it’s the busiest place around. Also stop in at the cafe attached to Dzhumaya (Friday) Mosque for a Turkish tea and snacks. 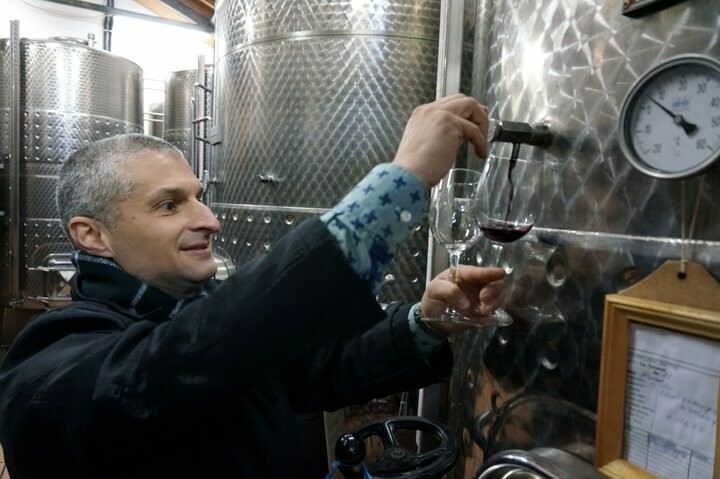 We headed out with Bulgaria Wine Tours and we absolutely loved it. We went to two wineries on a customized tour and we even got to taste some Bulgarian wine straight from the oak barrel. The vineyards around Plovdiv are some of the oldest and most beautiful in the world and I would say that missing out on a wine tour here would be missing a big part of the culture in this part of Bulgaria. The Thracians were the first people to colonize these lands and they were crazy about their wines, with many of their rituals and traditions directly linked to the holy grape. Make sure you try the local Ruben and Mavrut wines, as well as a mixture of the two. There are countless bars, bistros, nightclubs and cafes in Plovdiv and many of them have great live music playing every night. 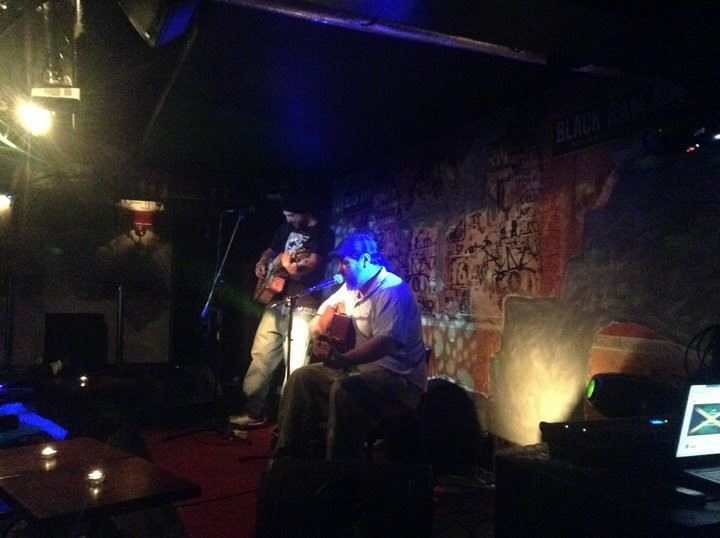 We were lucky to catch a Bulgarian band called “Party Party” playing in a small, dark tavern and they were fantastic. 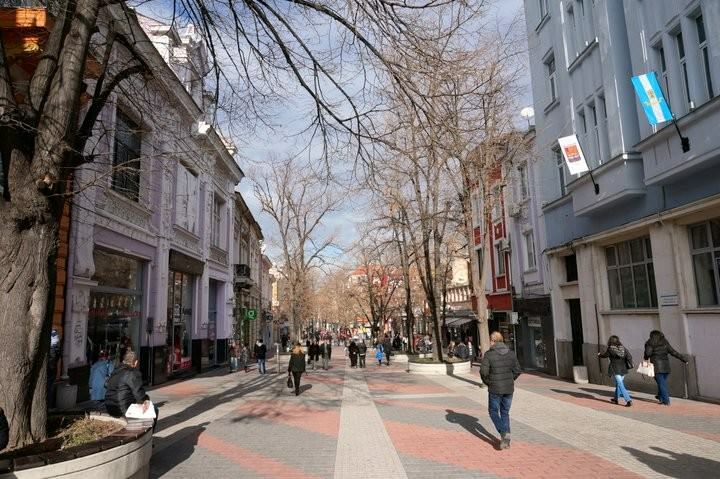 Kapana is a newly renovated area of Plovdiv that the locals call “The Trap”. They call it this because there are so many narrow alleyways and hidden back streets that it’s very easy for visitors to get lost and “trapped”. We recommend getting completely lost in this neighbourhood! It’s a beautiful area and once you’re inside, you’ll wonder what took the government so long to fund the revival of this magnificent old quarter. There are countless pubs and restaurants here with tables spilling out onto the street. The vibe in the trap is buzzing all year round, but during the summer, there are festivals and parties that shouldn’t be missed. The best place to do your own pub crawl is in the trap, but you could also do it in parts of the old town and near the pedestrian street. You can literally stumble from one bar to the next to sample different beers from the region. If you’re starting your pub crawl in Kapana, Don’t miss Cat & Mouse Bar (котка и мишка) and try the local Aylak Beer as well as a wide selection of other craft beers from Bulgaria and around Europe. Also, stop by the “Stop Bar” for a quick beer and some delicious food. The service and music can be questionable, but there’s no question that the locals love it. Not really a museum but worth a visit. The garden is located on the main street at the Southwest side of the city. There are a number of excellent Bulgarian restaurants in Plovdiv where you can sample some of the areas famous dishes, like Zelevi Sarmi (cabbage leaves stuffed with minced meat & rice), Guvech (clay pot meal of veggies and meat), and delicious Pateshki Sŭrtsa (duck hearts). 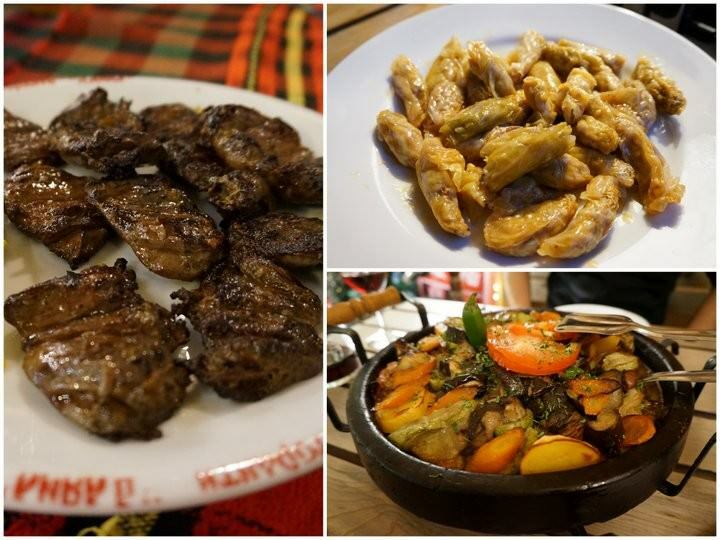 Some of the best restaurants for authentic Bulgarian cuisine include Rahmat Tepe on the hill in the old town just before the Nebe Tepe lookout. Restaurant Dayana is also a great place to try Bulgarian classics and cheap (but tasty) local wines. Don’t miss Restaurant Megdana which has a beautiful garden setting and nightly traditional Bulgarian folk music and dance shows. If you’re lucky enough to be in town when there’s a concert, symphony or show playing in the Roman amphitheatre, don’t miss it! The ancient auditorium still hosts musicals and plays and apparently the acoustics and the view of the city lights beyond the stage make for an unforgettable experience. We were in Plovdiv in the winter so we didn’t have a chance to catch a show, but after seeing the amphitheatre in all of its glory, we’d love to return to the city and catch a concert one day. It would be simply spectacular. Aylak means “to be relaxed and do nothing at all” and that’s exactly how Plovdivians live their lives. The expression is only used in Plovdiv and it’s a place that’s so special that when you visit here, you’ll agree that it deserves its own word. No words could explain just how enchanting this place can be, but Aylak does a good job of summarizing the feeling you’ll have when travelling here. Relax. Soak it all in and fall in love with Plovdiv. Everyone who comes here feels the same way and yet somehow, despite recent recognition as the 2019 Capital of Culture, Plovdiv remains off the European tourist radar for the most part. Get here before the word is out. Your experience is really great about Bulgaria and blog is fully informative for each and every traveler who decide to go there. Thanks Mary 🙂 We had a great time – short, but great! Amazing blog with nice information and great tips thanks for the share. 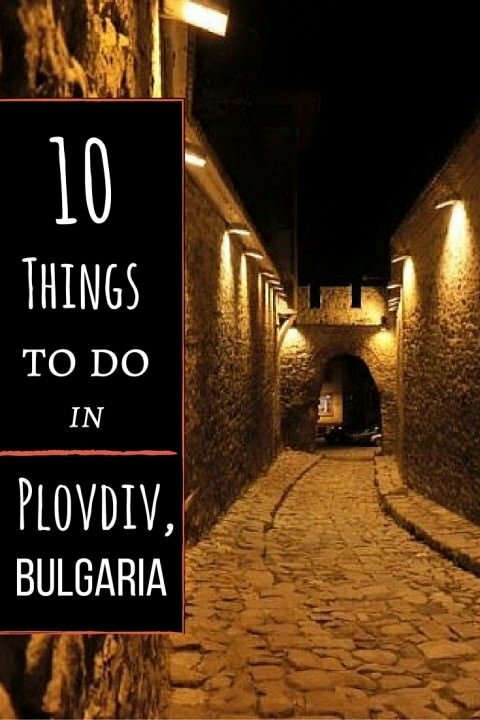 Sounds like Bulgaria – and Plovdiv – are worth visiting :-). We especially like to hear they make great wines there. Okay, so here’s an (unfair?) question for you. How do they compare to our Canadian wines? Especially the Okanagan ones. Of course, we love French and Italian wines, but half the wine we drink these days comes from B.C.’s Okanagan Valley or Osoyoos. The region is turning out some great wines (but they cost more than they should because of all our darn taxes). That’s the problem with booze in Canada, it’s just so expensive. We were drinking bottles of wine in Bulgaria for around $7 / bottle in a restaurant. The wines we tasted were a different grape variety, some found only in this region actually. They were very oaky and full bodied – we loved them! This is the second recommendation for Bulgaria that I have read in the last couple of weeks. It is now firmly on my must visit list! Will be saving this article for when I do visit, thanks guys. Great review of Plovdiv! We are excited to visit there tomorrow and your tips are great. I can’t wait for the walking tour and the wine tour. Thanks! 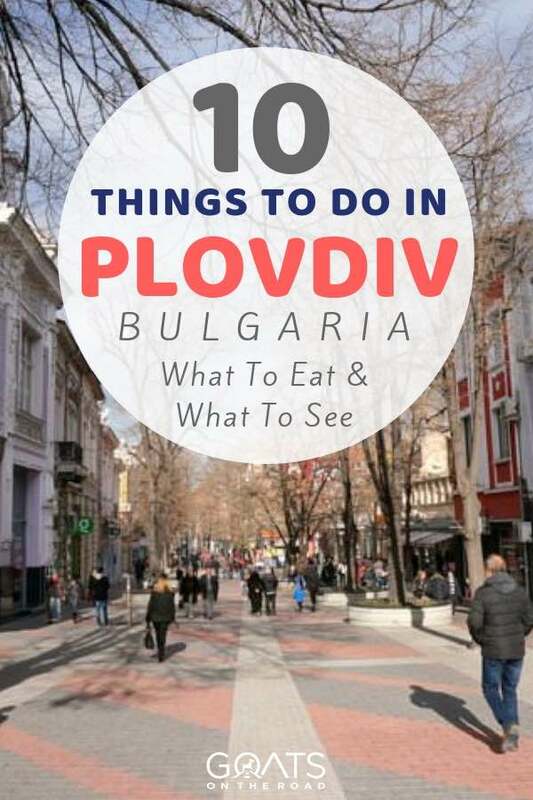 Hey guys, we’re heading to Plovdiv on Monday, so we’re feeling super excited after reading this and watching your video. Thanks for all the awesome tips . . . . I think we’re really going to like Plovdiv!! Plovdiv really is charming! I’ve been once and I’m planning on going again 🙂 Thanks for a great guide.